A dog of very ancient lineage, the Irish Water Spaniel can be traced back to the period, centuries ago, when the family of spaniels was divided into the land and the water varieties. 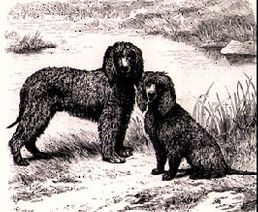 The water spaniels included the now extinct Tweed Water Spaniel as well as both the English and the Irish varieties. Printed in 1607, the book "Historie of the Foure-tooted Beastes", describes and illustrates the "Water Spagnel". The first known painting of an IWS was done in 1841. The Irish Water Spaniel, as its name implies, was developed in Ireland from two different strains which were in existence prior to the 1850's - the "South Country Water Spaniel" and the "North Country Water Spaniel". Both were distinct types in terms of color and size. The Northern dog has short ears, with little feather on them or on the legs, but with considerable curl in this coat. His color was liver with more or less white markings. The Southern dog was invariably solid liver with ears long and well feathered with the entire coat consisting of short, crisp curls. The IWS as we know it today, more closely follows the variety found in Southern Ireland. By 1859, dog shows were providing a special class for the IWS. In Dublin, a sportsman by the name Justin McCarthy sought to isolate the breed type as we know it today. He is given credit for refining the breed from its various varieties into a distinct and repeatable type. 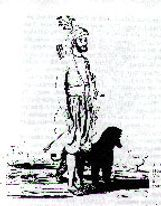 His celebrated dog, "Boatswain", was one of the first pure-type and best known of all IWSs. It is not known whether McCarthy saved a dying breed or "manufactured" one from the different varieties at the time. One thing he did do was fix type; no existing breed of dog has a more marked individuality of type and no breed has shown less inclination to diverge from it. shorter than the leg coat. Both may have shared a remotely, ancient common ancestor and gradually over the years, man has shaped the Irish Water Spaniel as we know it today. The Irish Water Spaniel was quickly received by both Irish and English sportsmen for its bold and daring retrieves, its extreme hardiness in the cold North Sea waters, and its superb disposition. By the 1870s, the reputation of the breed became known in America, and a number were brought over at that time. By 1875, the IWS was the third most popular sporting dog in the U.S. Over the years both field and hobby kennels have produced IWSs of great character, correct breed type and with a natural working ability.